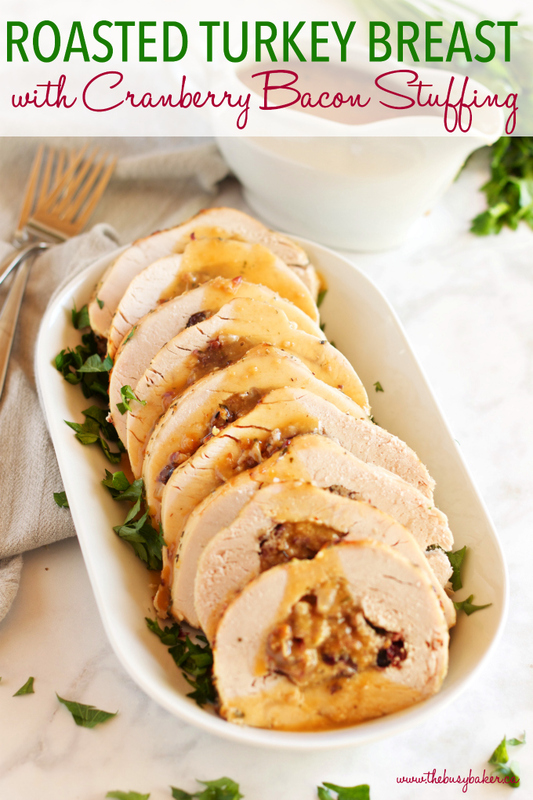 This Roasted Turkey Breast with Cranberry Bacon Stuffing is the perfect easy recipe for Thanksgiving or the Holiday Season when you don’t want to cook a whole turkey. 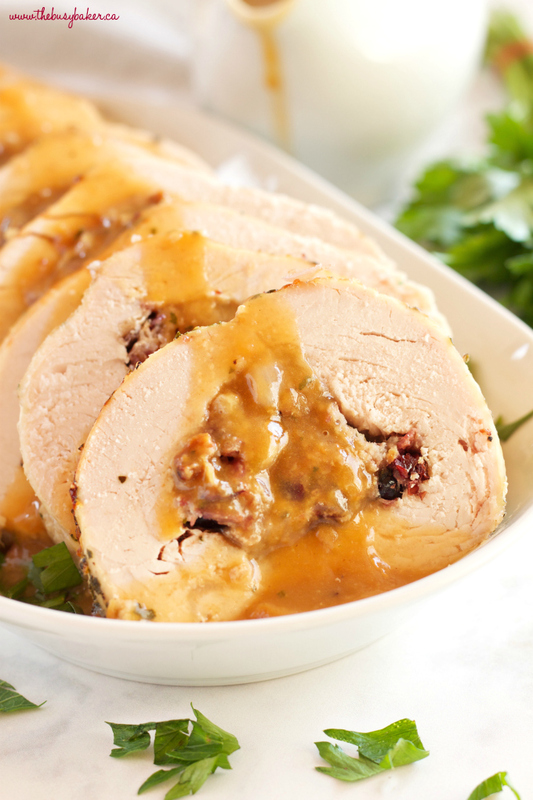 Juicy roasted turkey stuffed with an easy homemade stuffing with cranberries, bacon and herbs – this simple recipe is perfect for a small holiday dinner party! Watch the VIDEO below to see how I make it, and don’t forget to scroll down to the end of this post for the FULL PRINTABLE RECIPE! Whether we like it or not, the holiday season is coming quickly and it’s almost time to start thinking about all those holiday dinners and parties. Of course, because I’m Canadian, we get a jump start on Thanksgiving and celebrate it in October instead of November like Americans do. And since we live in Romania now, so far away from most of our Canadian friends and family, we don’t really get the chance to celebrate Thanksgiving the way we used to with a huge family turkey dinner with all the trimmings. There’s really no reason to cook a huge turkey just for our small family of 4, and if I’m honest there’s no way I could fit all the leftovers in my European-size fridge and freezer anyway, so it’s probably for the best that I stick to something different. In an effort to come up with a twist on the traditional Thanksgiving meal that would be perfect for a small crowd (or a family of 4, in our case), this Roasted Turkey Breast with Cranberry Bacon Stuffing recipe just had to happen. 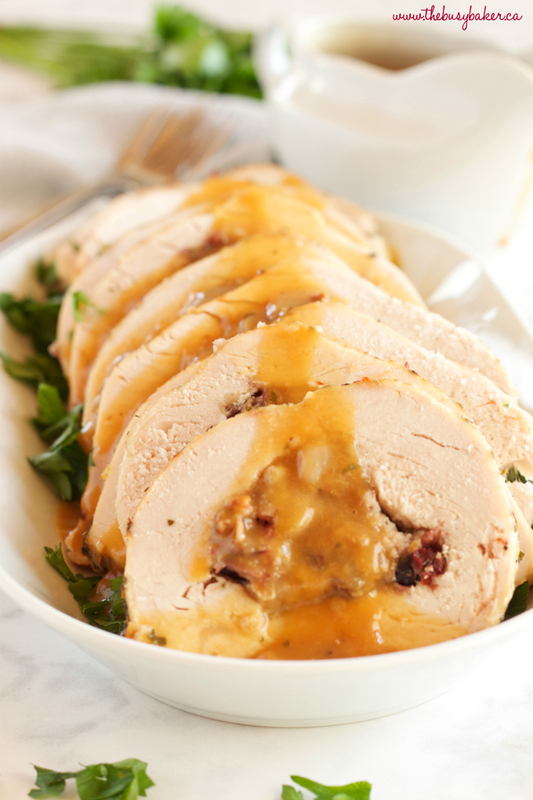 If you’re looking for a traditional-tasting main dish for Thanksgiving or Christmas, this Roasted Turkey Breast with Cranberry Bacon Stuffing is DEFINITELY the one for you! 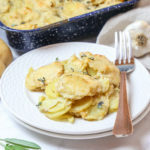 It’s a very straightforward recipe with a simple homemade stuffing that anyone with a frying pan and a few ingredients can throw together in a pinch. And the boneless skinless turkey breast is rubbed in a simple herb butter to create a delicious golden crust as it roasts, keeping the inside perfectly juicy and tender. 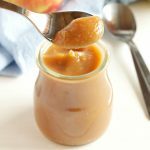 The 3 ingredient homemade gravy is also an absolute must with this recipe, as the flavors are simply divine! It compliments the flavors of the turkey and stuffing perfectly and it could not be easier to make! And don’t even think about skipping the butcher’s twine when preparing this Roasted Turkey Breast with Cranberry Bacon Stuffing. Securing the turkey breasts in this way ensures even roasting and the gorgeous presentation of this dish. Without it, the tightly rolled turkey would fall apart while roasting and you’d be left with a mess. Butcher’s twine is available at most butcher shops, supermarkets, or kitchen supply stores. 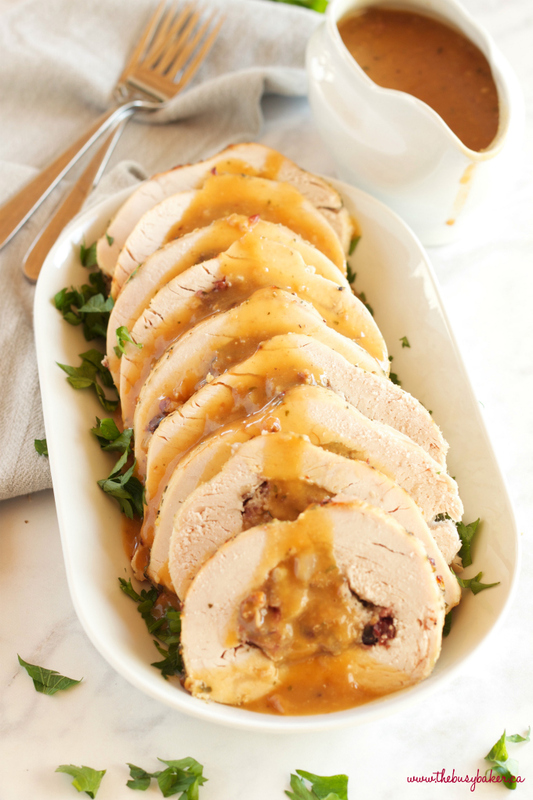 So if you want to impress your holiday guests with a simple, elegant meal with all the traditional flavors of a turkey dinner without all the effort, this Roasted Turkey Breast with Cranberry Bacon Stuffing is exactly the recipe you need! 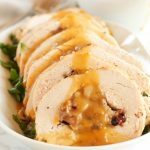 I hope you love this Roasted Turkey Breast with Cranberry Bacon Stuffing recipe as much as we do! Let me know in the comments below, what are you favorite recipes for the holiday season? Share them with me in the comments below! Looking for more delicious recipes for your next holiday dinner? My readers LOVE the ones I have linked below!! 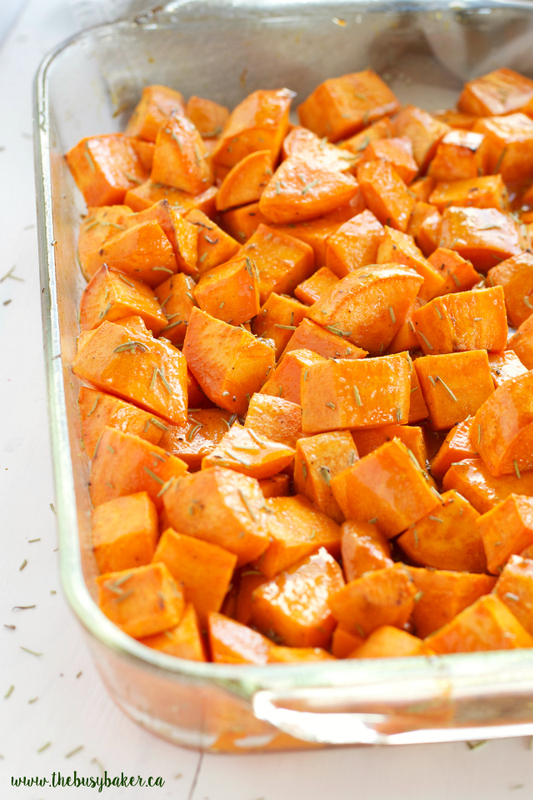 These Maple Rosemary Roasted Sweet Potatoes are SO easy to make, and they are the perfect holiday side dish! 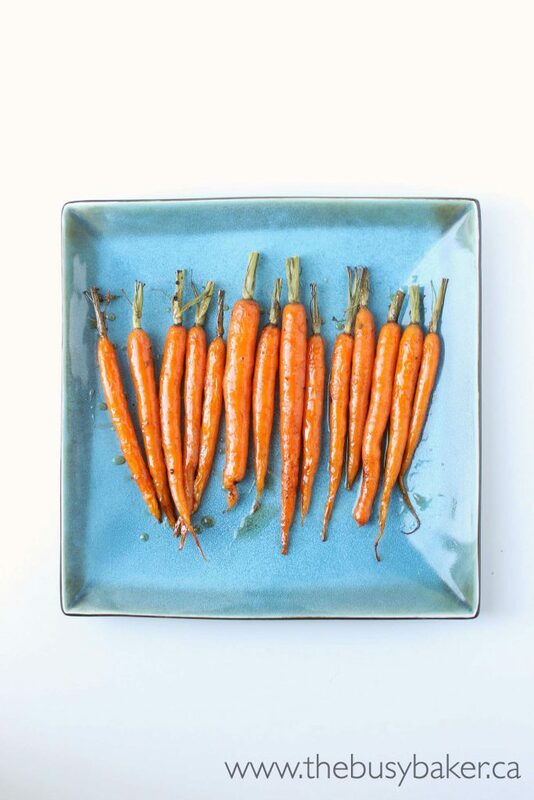 These Honey Balsamic Roasted Carrots are always a hit on any holiday table! 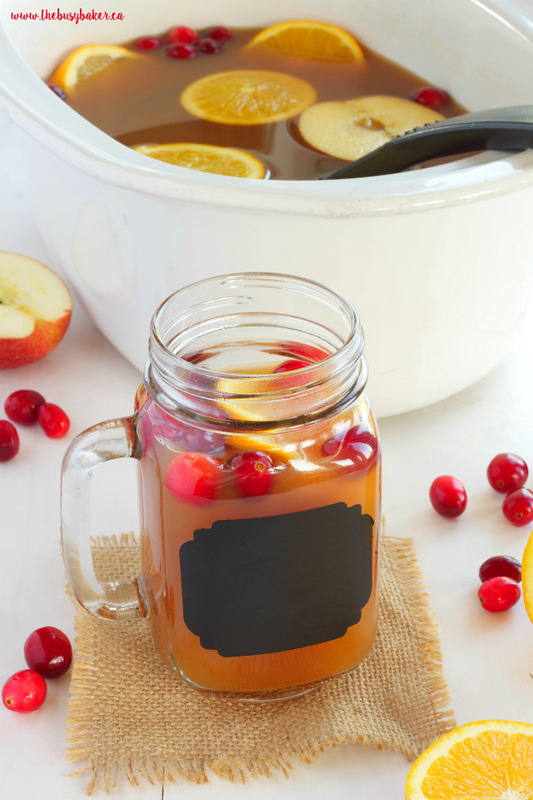 This Slow Cooker Cranberry Apple Cider is the BEST and easiest drink for holiday entertaining! 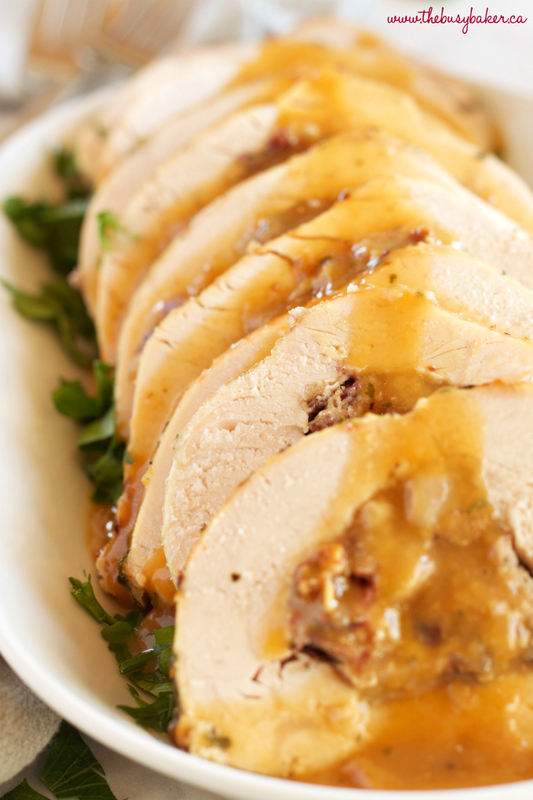 This Roasted Turkey Breast with Cranberry Bacon Stuffing is an easy holiday recipe! 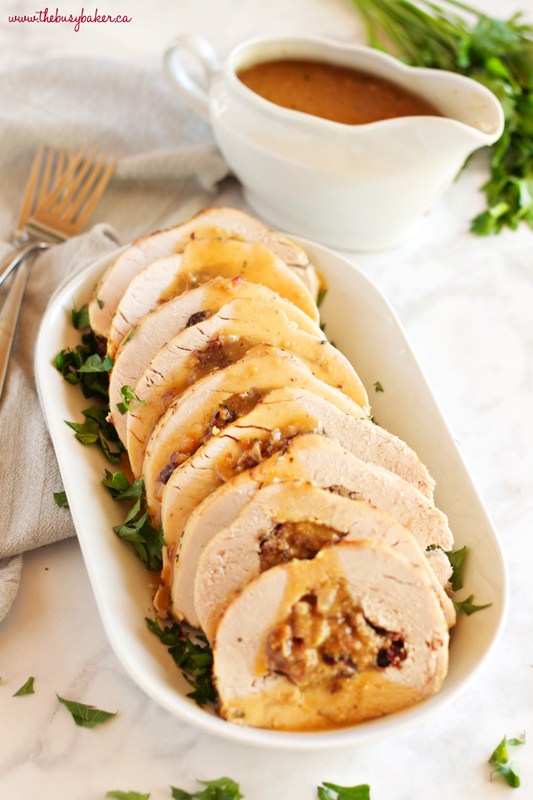 Juicy turkey and easy homemade stuffing with cranberries, bacon & herbs! Add the bacon and saute until the bacon is cooked completely. 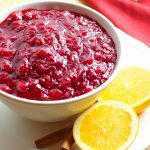 Drain the cranberries and add them to the pan, along with the the thyme, rosemary, parsley, and salt and pepper and stir to combine until the mixture is fragrant. Add the wine and allow the wine to cook off for about 5-7 minutes, stirring every few minutes or so. Turn the heat to low and add the breadcrumbs, stirring to combine and adding the chicken stock a little at a time until the mixture appears slightly dry, but sticky enough to form. Set the stuffing mixture aside to cool slightly while you prepare the turkey. On a large cutting board surface covered with parchment paper, butterfly the turkey breasts (see the video at the top of this post for a tutorial). Cover them with more parchment paper and pound them out to an even thickness using the smooth end of a meat tenderizer. Each turkey breast should be about one-inch thick. Divide the stuffing mixture between the two turkey breasts and place mounds of the stuffing in a line along the middle of each of the breasts. Roll them up carefully, bringing each end of the turkey breast into the middle over the stuffing. Place each of the stuffed turkey breasts seam-side down and use butcher's twine to tie around each of the stuffed turkey breasts in 4 places and cut off the excess twine with a pair of kitchen shears. Place the turkey breasts seam-side down on a greased rimmed baking sheet. In a small bowl, combine the butter, garlic, salt and pepper, and parsley and spread it over the top and sides of each of the turkey breasts before adding them to the oven. Roast the turkey breasts at 375 degrees Fahrenheit for about 25-35 minutes, or until the internal temperature of the turkey reaches 165 degrees Fahrenheit. The roasting times will be different for each oven and depending on the size of your turkey breast, so watch the turkey carefully after 20 minutes. For best results, and to ensure juicy turkey, use an instant-read meat thermometer inserted into the thickest part of the turkey breast instead of relying on roasting times. When the turkey reaches an internal temperature of 165 degrees Fahrenheit, remove it from the oven and gently move the stuffed turkey breasts to a large cutting board surface. Cover them loosely with aluminum foil, letting them rest at room temperature for at least 15 minutes before slicing. While the turkey is resting, prepare the gravy by adding all the pan juices (and all the little caramelized bits from the bottom of the pan) to a small saucepan along with the flour. Place the saucepan over medium low heat and whisk the pan juices together with the flour until it forms a paste. Add the water very slowly, about 3-4 tablespoons at a time, until the desired consistency is reached. For a thick gravy, add about 3/4 cup of water. For a thinner gravy, add up to 1 1/2 cups of water. Remove the twine from the turkey breasts using kitchen shears. Slice the turkey breast after it has rested into slices about 3/4 inch thick. Serve on a platter with the gravy and a sprinkling of fresh herbs, if desired. So fitting for me to be reading this post today! I was just talking the other day about how I am NOT making a big turkey this year. We live in Southern Spain and I make the effort pretty much every year. Honestly, it is usually too hot to enjoy it. And I hear you on the fridge size!!! Anyway, this looks a wonderful alternative to the full blown turkey. I bet it’s delicious as well! Thanks so much! I totally feel you on the living abroad stuff! 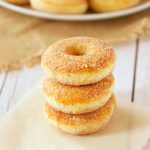 I hope you give this recipe a try this year instead of a big turkey! Your roasted turkey recipe looks so good! A nice alternative to the traditional turkey dinner. 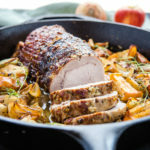 This is a great way to put a spin on dinner while still making my family happy by serving them turkey. Brilliant! Thanks so much for the feedback! And yes, the stuffing is SO SO good!! Thanks! 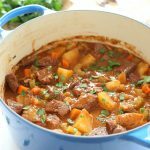 Yes, I make it now and then when our family is craving some good comfort food! I love the delicious simplicity of this dish! Slicing is up would be so much easier and more elegant than carving a turkey when everyone is waiting to eat! Thanks so much! Yes, this is MUCH easier to serve than a whole turkey! I think a stuffed turkey breast is a great idea! I enjoy turkey during the holidays, but the roasting a whole turkey doesn’t always appeal to me. This is such a great way to still have turkey, but not in excess. I have a 6 lb breast in the freezer. Definitely going to do your recipe as there will only be 3 of us this year. Could I just butterfly the big piece I have and put all the stuffing on it! I realize cooking time would have to be adjusted. 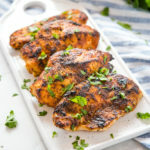 Thanks for posting such an easy and delicious looking recipe. Perfect timing!! Yes, that should work beautifully! I hope you enjoy the recipe!! Can this be made ahead of time; maybe the night before?